In the City of Lakes and Land of 10,000 Lakes! 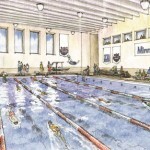 We are living in an historic time in Minneapolis: we are on the verge of having our first indoor public aquatics facility and it’s located right in the heart of the Phillips Community. When completed, this fabulous new aquatics center will provide swimming lessons for everyone (including adults), a state-of-the-art competition swimming and diving venue, exercise and aerobics classes, and community swimming. In recent months the Minneapolis Park and Recreation Board joined us in our belief that Minneapolis should have an aquatics facility. 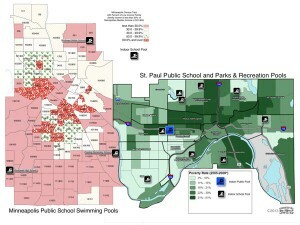 At the MPRB Board meeting on March 6th, President John Erwin stated that the city has a “moral responsibility” to ensure that children in the city learn to swim and, in particular, those many children with no real access to lakes and swimming lessons. This is why it’s vitally important that all children in Minneapolis learn the valuable life-saving and outdoor-access skill of swimming. When I close my eyes and remember, it’s wonderful to watch children learn to swim and see them grow in self-confidence as they conquer their fears and learn to safely navigate the water! Picture this! 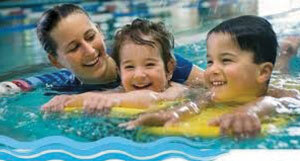 Kids between the ages of five and seven simply love water! Up to their necks and over their heads. You’ll see ‘em at the shallow end—pinching their noses and sitting on the bottom while holding each other’s hands! Then they explode to the surface! And do it again and again and again! Next you see a couple more scooting along the pool rim headed for the “deep end” to show off — nope, not afraid of water way over their heads! Over and over again, they do somersaults of triumph, defeating danger and death! Hey, it’s not over yet, because if there is a diving board, look out! Coming loaded with bravado and “dare-ya’s” — they creep closer to the edge and then do something between a “cannon-ball” and a “belly-flop” in they go, one after another, spiraling down into the waiting waters. After an hour or so of this and I’d swear those kids have grown an inch or two apiece! Go look into the other part of the pool. You will see an elder who’s gone through lots of life since being one of those kids and now is finding his or her way slowly back into the water. Sitting first in a hot tub or whirl pool to warm up the joints and muscles, an elder gradually navigates into the shallow end, carefully down the ladder, with a cane dropped aside the ladder along with a pair of flip-flops. Ahh, the joy of being able to move again! Perhaps not exactly like somebody connected with the Bolshoi Ballet, but still, smoothly and without fear of falling down, gaining balance as if years were simply shaved away! If you have Parkinsons, or a partial paralysis, this is like heaven! Just look around! 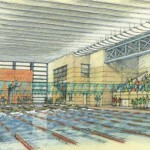 The “evolving” Phillips Aquatic Center: Team ready! This is what the Phillips Aquatics Center is all about — serving the great unmet aquatic needs of the City of Lakes and re-introducing a place for play, practice, competition and even recovery for the community. One of the best teams you could ever imagine is working very hard to bring a state-of-the-art aquatics center to the Phillips Community Center. This project began some years ago when, jolted by the loss of the Boys and Girls Club, members of the four quadrant neighborhoods of Phillips formed the Phillips Community Parks Initiative to focus on our park facilities and determine how to make them more useful and sustainable. Shirley Heyer wrote a grant to obtain an intern from the U of M to research and report objectively on the functionality of Phillips parks. The report had just been presented when we learned we had roughly a week to stop the Minneapolis Park & Recreation Board from either selling off and/or demolishing the Phillips Community Center which houses the pool. 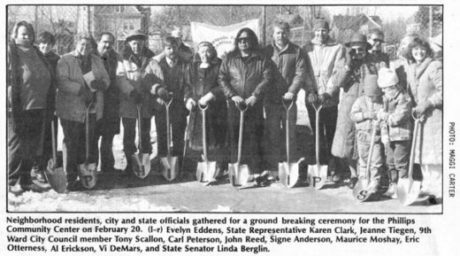 No sooner did community outcry bring that to a halt when we learned of the MPRB’s plan to send concrete trucks to fill-up the now empty cavity which once was the Phillips Jr. High’s, and then the Boys & Girls Club’s swimming pool. We managed to create enough public pressure to bring that to a halt. 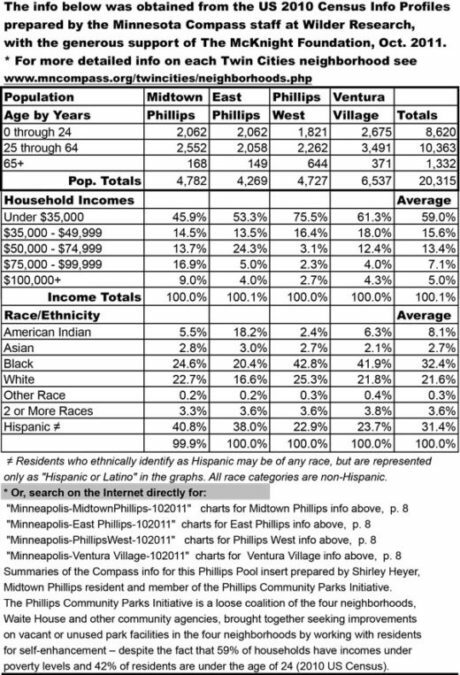 Ventura Village began a “Connecting the Dots” series of neighborhood meetings to try to determine how to retain the building for the people of Phillips. To this day, thanks to all this work of the neighborhoods, the Phillips Community Center still stands and the pool remains, awaiting new loving attention and water. The next chapter was led by Hannah Lieder who was inspired by the transformation she saw in Phillips kids whom she had taught to swim. Assisted by Rep. Karen Clark, Hannah began what turned out to be a two-year campaign at the State Legislature to seek the funding for her vision of the pool becoming the main piece of a reconstructed and expanded aquatic facility. The first year, despite long hours lobbying, Hannah’s bill was defeated on the last day. 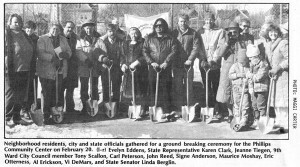 Doing it all again the second year brought success. In a very tough legislative session, Hannah’s bill was one of the few to make it through a crusty legislature in the midst of the continuing recession. $1.75 million in funds from the Legislature’s Bonding Bill was secured to begin restoration and revitalization of the Phillips pool. …and Hennepin County, and Augsburg. She also led efforts to convince Hennepin County to step forward with another $325,000 in grant money to match the legislative appropriation and brought Augsburg College to the table with another $100,000 of support. Hannah was awarded the KARE-11 Eleven Who Care Award this year for her work in saving the pool. Challenged by the Minneapolis Park & Recreation Board to develop a sustainable aquatics facility, Hannah, with her organization Minneapolis Swims, recruited the top aquatics experts in the country to put together a project that best meets the needs of the community and can be sustained into future years. The team consists of Tom Schaffer of USA Aquatics, Stu Issac and Duane Proell of Isaac Sport Group, Dean Dovolis and Mick Stoddard of DJR Architecture. Funding for these conceptual design and business plans came from the East Phillips Improvement Coalition, Ventura Village, Minnesota Swimming and Minneapolis Swims. Now, let’s consider the project. Beginning with a base project that essentially re-opens the current 6-lane pool for competition and lap swimming while creating a small shallow, warm-water teaching and exercise pool for children, elders and family activities. At a cost estimate of $2,250,000 this plan opens up the south side of the building where the new “teaching pool” addition will replace some current parking, and include a nice patio area and a completely new “drop-off “ pool entrance. However, it would use the old showers and would not function well for swim meets or gender-based swimming. Most of the capital funds for this option are already in hand, turning the focus primarily toward operations and long-term maintenance. 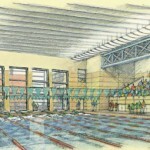 This option includes expansion of the competition pool to, much needed, 8 lanes, necessary for hosting competitive meets, adds spectator seating for up to 275 people, builds new showers and offers a larger warm water pool. With the additional lanes the pool could handle many more people and Phillips could develop our own competitive teams as they once did in the not so distant past. Take a trip down memory lane with Phillips families whose kids were involved in the Swordfish Swim Team. This plan would make changes to the outside of the building in terms of a two-direction outward expansion south and east toward 13th Avenue. Total cost estimate is $5.1 million. Moving up the development scale or—shall we say—to the grandest plan of all, we picture a $7.5 million pool project that further expands the Phillips Aquatic Center, again both southward toward 24th Street and eastward toward 13th Avenue. This expansion will include all the features of OPTION 2, namely the additional swim lanes, new showers, but adds additional spectator seating for 100 more people, a separate diving well, a larger warm-water pool, upstairs classrooms and a roof deck. 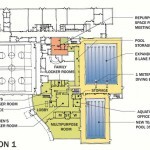 This plan would allow us to elegantly serve single-gender swimming in the teaching pool during normal business hours, while having the rest of the facility open for community swimming. 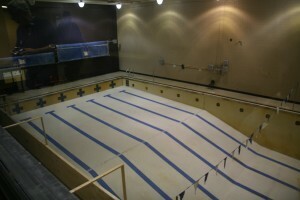 The plan will also allow us to host swimming meets while keeping the teaching pool open for community swimming. This plan would require a westward extension of the parking lot to accommodate additional vehicles. This will change the building’s footprint to a greater extent, but not necessarily to the neighborhood’s detriment as long as a larger-scale planning effort precedes this development. Mpls. Park and Recreation Board “On-Board” with partial operations support; signals a major paradigm change. While an effort by Minneapolis Swims and ISG Consulting has been made to offer a strong revenue-generating facility, which has considerable feasibility, at the March 6th MPRB meeting, the Park Board came forward with the willingness to provide some operational support. This is a major game-changer. Though the business plan includes scholarships and sponsorships so the highest-poverty, lowest-income residents will have access, the Park Board’s openness to helping with costs makes our commitment to continued access for our own population a greater guarantee. Venture Village General Meeting-April 10th- features a public presentation without Voting. In order to provide a deeper look into this project, Ventura Village will be featuring the Phillips Pool at its regularly-scheduled monthly General Membership Meeting on Wednesday, April 10th. The public is invited to this event, beginning at 7:00 PM, which is located in the same building as the proposed pool project. Minneapolis Swims has been invited to present and bring members of the development team to assist in making this project clearer to attendees and navigate the various options to be considered. No vote will be taken on the various options as it is only informational in its appearance on the agenda. Funds are already pledged to the project. A “Connecting-The-Dot’s” Open House and Pool Conference is also scheduled for Wednesday, April 24th from 6:30 to 8:30 PM at the Phillips Community Center, located at 2323 Eleventh Avenue South. Snacks and beverages will be provided as this program offers an even greater opportunity for residents and stakeholders in Phillips to come forth and dig deeper for answers and a greater understanding of available options. 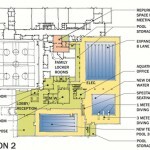 It is expected that Ventura Village will revisit the project in May and then provide support for one of these options. 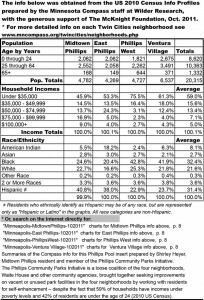 East Phillips Improvement Coalition has already gone on record supporting an option and the other two Phillips Community neighborhoods can be expected to do so as well. For further information, Alley Communications has posted a slide show of all 29 color slides of the Phillips Pool and various options on its alleynews.org website. The business plan will also be posted for perusal so readers can attend the Open House and engage the development team in meaningful dialog regarding this project. Come and watch our Phillips Community grow before our very eyes! At present most of our youth cannot swim…but someday soon Phillips may be providing trained lifeguards for the City of Lakes. Someday there may be an Olympic champion swimmer or diver from Phillips and we could be celebrating his or her victories. We might have a whole generation of parents who learned to swim here years ago watching their own kids revel in the water at the Phillips Community Center as they once did. It is hard to imagine a project that will better serve the needs of all the diverse people of this community and the city as a whole, bringing youth and all the rest of us together for recreation, competition, health and just plain fun. Regardless of whether we get the base or deluxe package, in the end, all of us should support this effort in every way we can! Brad Pass is an East Phillips resident and Chair of the East Phillips Park Cultural Community Center Partnership. Carol Pass is an East Phillips resident and President of EPIC. Hannah Lieder is a resident of East Phillips and E.D. 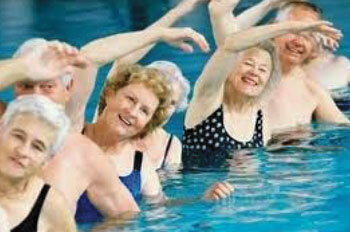 of Minneapolis Swims. 45 ft. X 75 ft. 1 in. 30 ft. X 40 ft.
60 ft. X 75 ft. 1 in. 34.5 ft. X 75 ft. 1 in. 45 ft. X 40 ft. This Special Phillips Aquatic Center Special Supplement was paid for by East Phillips Neighborhood Improvement Coalition, Midtown Phillips Neighborhood Improvement Association, Phillips West Neighborhood Association, and Ventura Village Neighborhood Association. Collaboration process and production facilitated by Alley Communications, Inc.